CSMI, LLC a leading provider of technical services and integrated logistics support solutions, announced today that it has been awarded a $9.3 million prime contract for continued support for the Federal Protective Service’s Mobile Command Vehicle program. Under this contract, CSMI will expand its current technical and operations support of the MCV program to support all major regions in the Continental United States. CSMI provides Operations and Maintenance (O&M) support for a fleet of Mobile Command Vehicles, which supports the DHS FPS mission through the provision of mobile, on-site platforms for command, control and communications during terrorist attacks, natural disasters, National Special Security Events, and other similar occurrences. 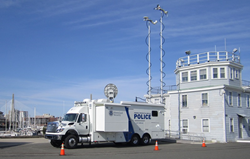 CSMI performs rapid deployment of MCVs to any location in the Continental United States where the communications infrastructure is inadequate or has been disrupted, or where enhanced interoperability among law enforcement agencies is needed. MCVs provide comprehensive communications capability to include; Cellular and Satellite, secure and non-secure telephone, Satellite and broadcast television, VHF, UHF, 800 and 900 Megahertz radio system frequencies, video teleconferencing, Mesh networks, video capture and security imaging, command post support and other critical command and control capabilities. Founded in 2002, CSMI, LLC is a Service-Disabled Veteran-Owned Small Business (SDVOSB) which provides Worldwide Support to the U.S. Government, Defense Primes and Host Nation customers. Headquartered in Lawrence, Massachusetts, CSMI is a leading technical services provider of Mission Support Solutions, Integrated Logistics Support of C4ISR, Antiterrorism Force Protection Systems (AT/FP), Seaport Security and other mission-critical security technologies. CSMI’s expertise includes: fielding and lifecycle management, Integrated Logistics Support, forward Field Sustainment, New Equipment Training (NET), communications integration, operations management, and Systems Engineering and Technical Assistance. Over the past 14 years, CSMI has deployed more than 600 personnel to four continents in support of U.S Government Customers. CSMI is best known for providing rapid response and customer-centric focus that small businesses are best suited to provide. Please visit CSMI’s website at http://www.csmi.com or email us at information(at)csmi(dot)com with any inquiries you may have.